Perfect quality of surface finish of your backplate. Some parts of scuba dive gear made of stainless steel as backplates or D-rings must be subject to the polishing process to provide them with adequate look, and additionally to protect them against corrosion in salt water. From the two polishing processes: mechanical and electrochemical, we have selected the latter as the one providing the best visual quality. In contrast with the mechanical polishing, the electrochemical one does not leave microscopic scratches, and consequently provides better steel protection in the aggressive marine environment. 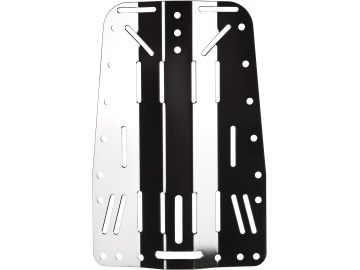 Your backplate would shine for a long time.